101 tips from professional storyteller Mark Goldman. "A masterful work! Mark's 101 tips are funny, witty, and totally comprehensive! I wish I had this book when first starting my career! All the basic fundamentals of story/theatre are here compacted into this little power house volume! The man left no stone (or story) unturned!" "Mark Goldman’s 101 Tips for Creating, Crafting and Telling Stories brims with important ideas for both inexperienced and experienced tellers. They are gleaned from Mark’s years as a storyteller and storytelling coach, and delivered with clarity and humor. Toward the end of the book, Mark suggests that a storyteller take a bow after each performance. Among other things, he explains, bowing gives the audience a chance to show their appreciation for what you’ve done. Well, then, take a bow, Mark Goldman." "You have made the decision to be a storyteller and you wonder where to start. 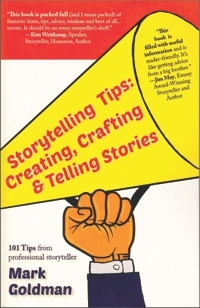 Look no further than Mark Goldman’s new book Storytelling Tips: Creating, Crafting, and Telling Stories. It is a practical personal guide that will support your journey. He makes the “how” and “why” of being a storyteller visible. I highly recommend it." Full Review By Storyteller Kevin Cordi, Ph.D.
Mark Goldman’s latest book Storytelling Tips: Creating, Crafting and Telling Stories provides valuable instructional tools to engage and learn the art of storytelling. It covers all facets of the art of being a storyteller. However, the ideas are presented not as chronological ‘must do’ activities, but instead Mark invites the reader to do what they are comfortable with and to roam around in the text and find what works for the needs of the storyteller. He peppers the work with the sage advice of professional storytellers, but what is especially inviting is that Mark shares his process of development as he recommends the activities. For example, in an activity called “There’s Always Another Side to the Tale…and the Tail,” we hear Mark sharing the value of switching POV, including a cameo of his dog. Unlike some instruction guides, Mark is ever present in this work and we are rewarded because of it. One of the more powerful reminders is called “The Endowment Exercise” (p. 125) where Mark shares how renown theater expert Uta Hagan speaks to the power of an actor to place all their energy with the use of props such as a tea cup. He shares how the teacup may look like a store bought copy, but in the hands of the actor is must be used as the script demands. However, at the end of the activity, Mark reminds us that storytellers need to do this through the imagination because the physical cup is not there. He values what makes storytelling unique to the teller. Mark’s book helps us embody what it means to be a storyteller. He makes the craft visible. It is a useful and valuable guide that I will keep with me as I journey to understand this art. Because each of Goldman's 1-2 page tips is as appealing as a crunchy tortilla chip, it's tempting to munch through a lot of them at one sitting! But to get the real good of his experienced advice, try to take them just one or two at a time and really digest them, because they pack a lot of nutrition. Compiled from two years' worth of weekly online newsletters, these tips reflect wisdom gleaned from colleagues' workshops as well as Goldman's own work as a teller, teacher, and coach. He has sorted them into General advice, Creating stories, Crafting stories, and the Telling process itself. A beginning teller will find several conferences' worth of good information here! A veteran teller will probably find some novel gems too, as well as being reminded of good ideas that should be tried again. Goldman has a knack for coloring each tip with concrete, specific examples that make his point better than a generalized description--and prove that he knows the value of a good story. This book is highly recommended for tellers at all levels of experience. Mark Goldman's book is completely delightful and engaging. While his subject is storytelling, his understanding of the power of expression will be useful for anyone who wishes to communicate effectually onstage or off. It is a comprehensive well-crafted text for anyone on the techniques of speaking effectively in public or privately. The author has a gift for writing in simple easy-to-absorb language, utilizing humor and his own life experiences. At the same time, he conveys his ideas with great sophistication which is a clear compliment to the reader. I especially admire the structure of the book. Most of the many chapters are short--often just a page and a half. He is especially skilled at embracing an idea and expanding in simple exacting terms. This keeps the momentum going and makes the volume an easy and enjoyable read. As a former actor turned artist/poet, I am in awe of Goldman's understanding of how one can develop and harness their own unique power of expression. I highly recommend this one! Mark Goldman has been publishing an insightful, practical, online, weekly newsletter of storytelling tips (at StorytellerMark.com) since 2012. Two years of those newsletters are now a book of advice, organized helpfully into categories. Novice tellers will find Storytelling Tips especially useful, but since the pieces are lively, with many anecdotal examples, even experienced performers may turn page after page addictively. (As Samuel Johnson famously remarked, people “more frequently require to be reminded than informed.”) Who can’t use superb prompts for creating stories? Vivid examples of first lines? A cogent pronouncement about when not to accept a gig? A thoughtful meditation about how to accept critical feedback? All this and much more. Enjoy this engaging miscellany!